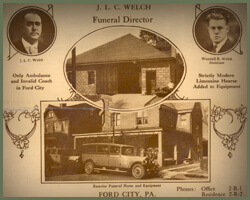 The Welch Funeral Home was established in Ford City in August of 1912. The Welch Funeral Home’s founder was J.L.C. (Curby) Welch who moved to Ford City from the Smicksburg, Pennsylvania area. The original funeral home was on the 800 block of Fifth Avenue. It then was moved to the present location at 1032 Fourth Avenue in 1943. The Welch family has served the Ford City and Kittanning area for four generations and will be celebrating its 100th anniversary in 2012. We are the oldest family owned funeral home in Armstrong County. After the founding of the Welch Funeral home by J.L.C. (Curby) Welch, the funeral home was then continued by Wendell A. Welch from 1943 until his death in 1988. The funeral home is continuing the family tradition by Curby Welch’s grandson, Robert D. Welch.